Decades before it became ‘80s-movie shorthand for “establishment scoundrel,” the preppy look was, dare we say it, actually cool. It’s been the subject of anthropological examination in books like Take Ivy, and a constant source of inspiration for many top designers in men’s fashion. Take a closer look and preppy style reveals many iconic elements that transcend the genre―yet are bound together by an ethos that endures still today. Ready to raise a glass to Ivy League style? Don’t be afraid. They’re only boat shoes. The Ivy League style (variously known as “preppy” or “trad”), is like another American invention, the cocktail: a mix of bitter and sweet, restraint and rococo, college man and businessman. It all starts in the 1890s. Brooks Brothers was importing British garb by the boatload (button-down Oxford shirts, Harris Tweed, the polo coat, argyle socks, etc.) and college-aged men were wearing them on campuses in the American northeast―particularly at Harvard, Yale and Princeton. The campus men were selective though, opting for casual, hardy fabrics. They insisted on comfortable footwear like penny loafers and weejuns. They wanted natural shoulders, shirts without darts, and un-pleated trousers. Over decades, the collegiate upper-class would blend Old England with New England, and create the Ivy League look. Here are the elements of the preppy style. The preppy look is awash in contrasts: City vs. country. Urban vs. rural. Prince vs. pauper. The madras shirt provides a fine example. The article was designed and worn by the Indian rural class. It was later repurposed as a status symbol for the jetsetters who could afford to travel and thus experience its vibrant, handspun colors. The imperfections and flubs in the fabric convey authenticity. It’s unknown whether Scottish tartans or Madrasi checks came first. Avid boater and sailor Paul Sperry desperately needed a pair of shoes to keep him from tumbling off the top of his watercraft. His solution: cut a Herringbone pattern into the bottom of his shoes. The newly-non-slip shoes worked, but they also left scuffs so Sperry made the soles white. Thus the top-sider was born. The process of cutting into the bottom of a shoe had already been invented by John F. Sipe and was known as “siping.” Sperry still benefitted from it. Sperry was inspired by watching his cocker spaniel, Prince, easily sprint across ice. Boat shoes feature a moccasin toe, are top-stitched, and should never, ever be worn with socks. A leather braided belt is the only way a trad man should hold up his pants. The brass buckle and brown leather are reminiscent of strong Ivy League motifs: from the Princeton library to the rigging of a 20-foot cutter. These belts easily add texture and contrast to the muted tones of chinos and khakis. Because of their construction, opting for high quality is worth it so they don’t fall apart. Every preppy man needs at least one. The Oxford shirt hails from Scotland, not Oxford, but the producing mill named their weaves after famous universities: Cambridge, Oxford, Harvard and Yale. In what turned out to be a prescient move, the shirt became a hit at a few of those schools. The founder of Brooks Brothers discovered the button-down collars of polo players while watching a match in England, and incorporated the concept into their designs. The button-down collar was originally called the polo collar. Style legend Gianni Agnelli was known for wearing these shirts. An Oxford shirt weaves two different strands of yarn to produce a basket-weave finish. Rene Lacoste claimed to have put the first embroidered logo on a garment. While that’s probably hard to verify, it’s certainly true that the crocodile shirt became a preppy staple―and so too did a fondness for embroidered pictograms on clothing. “Critter print” (to distinguish from “animal print”) can be found on all sorts of preppy accessories and garb, like neckties, shirts and even up-and-down the legs of “go-to-hell” pants. The Jantzen girl logo appeared on swimsuits before Lacoste’s crocodile, so their claim is somewhat dubious. Animal print refers the hide patterns like tiger stripes or cheetah spots, whereas critter print features silhouettes of different creatures. Be brave with critter print: YOLO. It’s the great-grandson of the English boating jacket which would keep oarsmen warm during training. It was their bright, brash colors, however, which kept spectators’ eyes glued to their favorite team on race day. The term “blazer” was first used in reference to the “blazing” red coats of the Lady Margaret Boat Club. It’s a pillar of the preppy look. Gold buttons are optional, but awe-inspiring. The Ivy League is inspired heavily by sport—but not the sandlot. Mostly upper-class pastimes like boating, equestrian polo, tennis and lacrosse informed varsity styles in trad or preppy clothing. Cable knit first showed up on the pearl white tennis sweaters, with their underlined V-shaped neck, that were a hit with athletic types. Cable-knit white sweaters were also popular in cricket and squash. Not really worn in sport anymore; instead wear them with a shirt and tie. Drape one around your neck for 100+ preppy points. The enthusiasm for rugby gear in the trad style is more of an expression of Anglophilia, rather than a penchant for scrums, drop goals and trys. Rugby is quintessentially British, and its aesthetic of bold colorful stripes and a white collar is very much in line with other preppy items. Pair with a blazer for a high-brow/low-brow look. The classic stripes are burgundy and navy, but you can now find them in every color. A pamphlet for preppy might be made of Harris Tweed, and the Harris Tweed sport coat acts as an excellent primer to this style. It was imported out of a demand for rougher but casual fabrics suited to campus life—what was good enough for the English countryside was good enough for the quad. But not just any tweed. Only Harris Tweed would fit the bill for Ivy Leaguers. Relaxed shoulders, less structured than a blazer. It’s made of 100% pure virgin wool. Harris Tweed is a registered trademark: look for the orb. The marmoreal Tom Wolfe must have felt equal parts wonder and revulsion when he wrote about these pants in 1976: “a solid airmail red or taxi yellow or some other implausible go-to-hell color.” Actually, the red is actually known as Nantucket Red, but it’s just as implausible. The pants were born in NY, but raised in Florida—where they sprung to life on the links. They are the definition of statement wear. Some go-to-hell pants have mismatching critter prints on each leg. Proceed with extreme caution when wearing GTH pants. This is the second shirt to bear the name polo (the first is the Brooks Brothers’ oxford button-downs), but it’s somewhat of a misnomer. The polo shirt is truly a tennis shirt. It was designed by French tennis champion, Rene Lacoste. He designed a white, short-sleeved, piqué cotton shirt, and wore it to the 1926 US Open. The shirt was eventually adopted by golf and polo players too. The button-down shirt was first worn as a polo uniform. Lacoste was known as “Le Crocodile” hence the famous Lacoste logo. Not only did he debut the shirt in 1926, Lacoste won the event too. The Ivy League look reached its zenith in the post-war area, but the forces of fashion turned the page on prep at the end of the sixties. The style was crushed by under the (bare) feet of a new generation who wore tie-dye, bell bottom jeans, and flowers in their hair. Harris Tweed and horn-rimmed glasses were suddenly out-of-place on college campuses—unless you were part of faculty. But the look was not gone. While prepdom lay dormant in the era of wide-collars and polyester, brands continued to produce Ivy-inspired gear. The Ivy League look has made an unmistakable impact on the world of ready-to-wear clothing. In fashion—and in polo—what goes around, comes around. Today, a new generation is already adopting preppy motifs and icons into their style, while making it all their own. 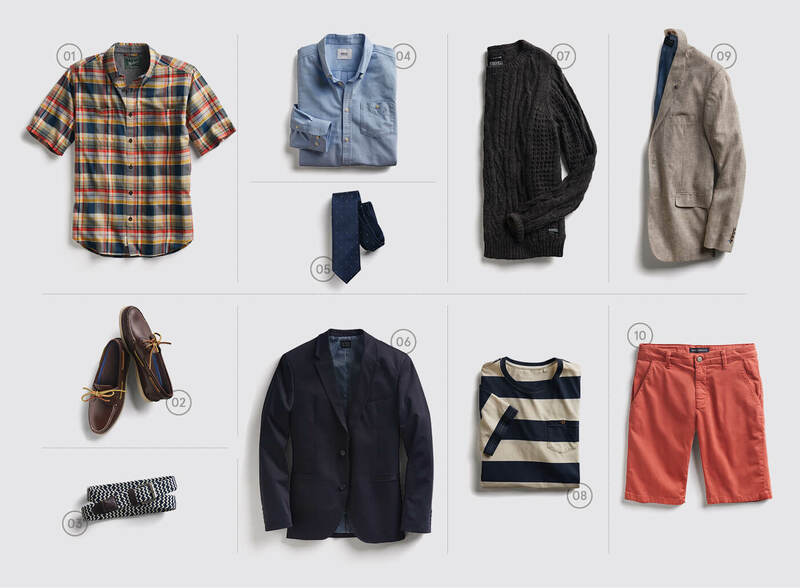 Want to add some prep-inspired style to your next Fix? Ask your Stylist.